Who Buys an H.R. Pufnstuf coloring book? Who buys a H.R. 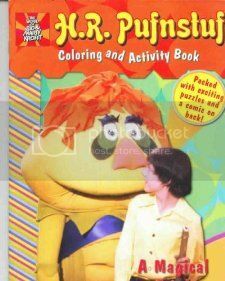 Pufnstuf coloring book? A recent walk through the toy aisle at the local dollar store surprised even the relatively un-surprisable staff here at Comics on the Brain. For anyone who grew up in the 1970s, this show was a Saturday morning staple, as we followed the short-lived adventures of Jimmy and his magic flute on Living Island. It was only later that most of us really “got” the show. Though creators Sid and Marty Krofft deny any such intent, the show seems laced with drug-use references. How can we doubt them when “A Magical Trip” is the title of one of these coloring books? Drug references or not, just who buying is “H.R. Pufnstuff” coloring books? Not many kids are interested in TV shows from 1969. Heck, not many adults are interested in TV shows from 1969. But someone is, and I’m betting it’s those nostalgia lovers who are planning a magical trip of their own.